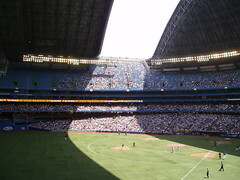 Yesterday, on our way to the ballpark formerly known as SkyDome, I referred to our dome as SkyDome. 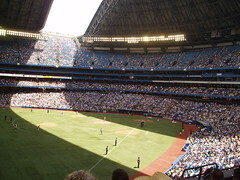 My six-year old corrected me, letting me know it's called the Rogers Centre now. 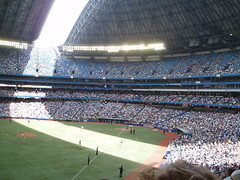 I told him he can call it what he wants, but it will always be SkyDome to me. 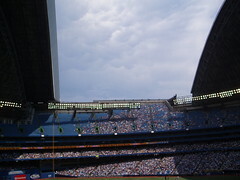 Although yesterday afternoon's game began with the roof open and the sun spilling in, the forecast turned sour and they closed the dome. 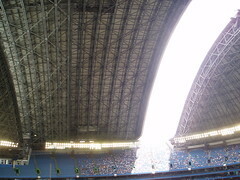 I've been in the dome several times when they've closed it, usually for rain but once to get rid of a bunch of bugs, so I've seen it close before, but it never ceases to amaze me. 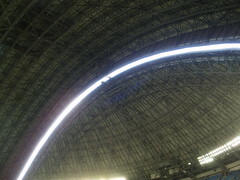 In about 20 minutes the dome goes from an outdoor stadium to an indoor facility. 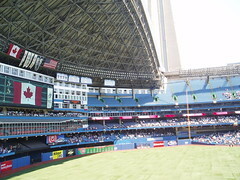 Here's a play-by-play review of the roof closure as told through my camera yesterday. 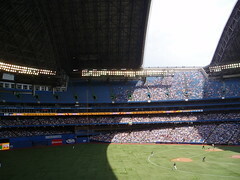 That is still one of the most incredible sights to see even if the place is almost 20 years old. Great photos. It was fun to watch it closing. I forgot my sunscreen yesterday and began to get a little anxious about being directly in the sun.....then I look up and I see the Gods of the dome are awknowledging my unvoiced concern and pulling the shade. My girls loved the doing the wave as well. I love that last shot, with just the sliver of white light coming in. Nice job.